Do you struggle with managing low-value items such as fasteners and C-Class parts due to their sporadic usage? These infrequently used items need to be managed differently than your high-volume parts, which are best managed through our multi-bin Kanban systems. But how do you manage high-mix, low-dollar parts when the anticipated usage is unknown or inconsistent? General Fasteners has the perfect solution! Introducing our Smart Bin inventory management system powered by Apex Connect n’ Go Technology™. This single-bin, “virtual VMI” system is operated via a wireless connection to the cloud that electronically monitors inventory and generates a replenishment order in real time when inventory levels drops to predetermined quantities. The system operates 24/7/365, and eliminates the inaccurate and labor intensive process of manual counting. Because the system generates an order only after a specified quantity has been consumed, the replenishment is based on true pull-system theory. This ensures minimal on-hand inventory and maximum up-time. This is not your typical bin system! Our Smart Bin System offers flexible configurations with respect to number of shelves, bin sizes, and Internet connection options. The bright interior LED lights and compact footprint help contribute to a 5S environment, making the contents visible and orderly in even the harshest of environments. Indicator lights even change colors to let you know parts are on their way! A long-time GFC customer approached us with a challenge of how to manage their parts with dramatic fluctuations. Once high-volume, VMI parts, these parts have since become sporadically used service/special configuration items, and therefore removed from the VMI program. The customer struggled with these parts ever since removing them from the program and needed help. The Smart Bin System by GFC was the obvious solution! The GFC Program Management group conducted an onsite-survey of the situation, determined optimal bin quantities, and established the ideal Smart Bin setup for the solution. Once the customer gave the green-light, the same GFC team constructed the Smart Bin racks, filled the bins, and trained the system to generate orders at the appropriate quantities. The picture tells the story of just how much more organized the program is today. 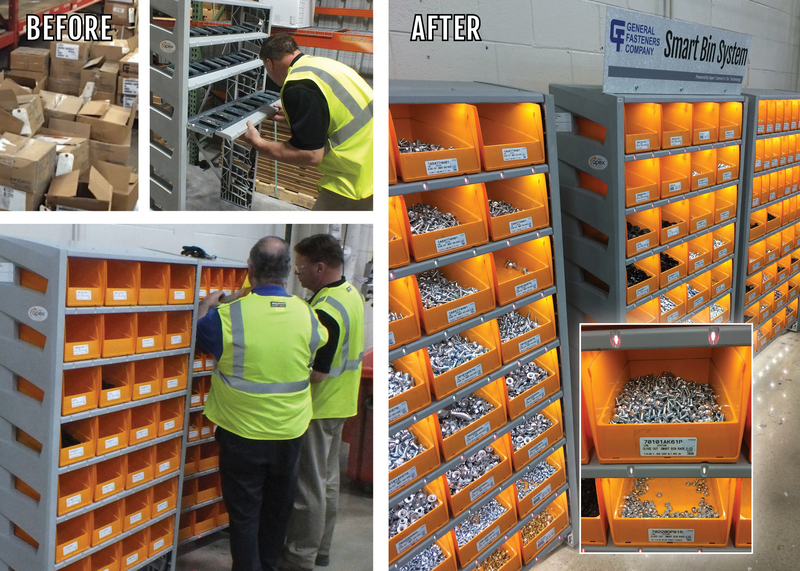 Not only did the customer reduce their on-hand inventory, they eliminated their part outages, increased their up-time, decreased their labor, and freed up a considerable amount of space on their production floor. It was a complete success! The Smart Bin System is a great complement to our high-production, KanBan based VMI programs that utilize barcoding technology and electronic exception monitoring. GFC has been in the business of helping our customers with their Fastener and assembly component needs since 1952. Let us show you how having the Right Solution, the Right Parts, in the Right Quantity can help you reduce inventory, increase productivity, and put more money in your pockets! If you’re interested in learning more about our Smart Bin System or other inventory management solutions, please send an email to gfsales@genfast.com or fill out the “Contact Us” form. We are happy to provide a complimentary consultation!